Maryland’s Matt Rambo and Zoe Stukenberg Named 2017 Tewaaraton Award Winners! WASHINGTON, June 1​ – The Tewaaraton Foundation has announced University of Maryland attackman Matt Rambo and University of Maryland midfielder Zoe Stukenberg as the men’s and women’s winners of the 17th annual Tewaaraton Award, presented by Under Armour. The Tewaaraton Award annually honors the top male and top female college lacrosse players in the United States. This is the first time in the award’s history that two players from the same school have won the award in the same year. 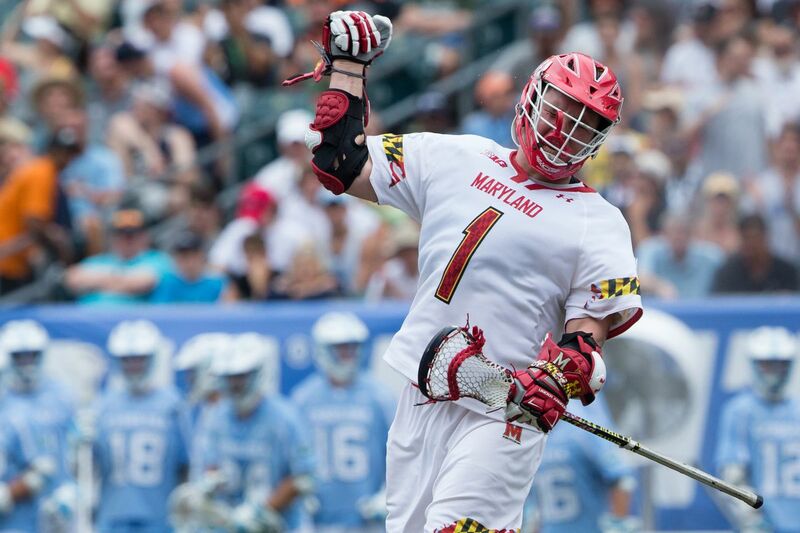 The all-time points and goals leader in Maryland’s prestigious history, Big Ten Offensive Player of the Year Matt Rambo led the Terps to their first national championship since 1975 and fourth straight Final Four appearance. The three-time USILA All-American helped the Terrapins to a Big Ten Championship and NCAA Tournament No. 1 overall seed for a second consecutive season. In the process, he became the first Terp to notch more than 40 goals and 40 assists in a single season, and earned the USILA Lt. Raymond J. Enners Outstanding Player Award. Rambo’s 87 points and 45 assists were best in the Big Ten and good for third and fourth in the nation, respectively. The senior attackman from Glenside, Pa., is Maryland’s first men’s Tewaaraton winner, the program’s second finalist (Joe Walters, 2006) and the first winner from the Big Ten Conference. The five men’s finalists were University of Denver faceoff specialist Trevor Baptiste, University at Albany attackman Connor Fields, Yale University attackman Ben Reeves and Loyola (Md.) University attackman Pat Spence, and Rambo. Maryland co-captain Zoe Stukenberg led the Terps to a 23-0 record, including the Big Ten regular season and tournament titles, No. 1 seed in the NCAA Tournament, a ninth consecutive trip to the Final Four and 14th national championship—the program’s third in four years. A first-team IWLCA All-American, the senior was named Big Ten Midfielder of the Year and was a Big Ten and NCAA All-Tournament Team honoree. The Ellicott City, Md., native ranked in the top three of every statistical category for the Terps, with 53 goals, 31 assists, 84 points, a team-best 48 ground balls, 74 draw controls and 21 caused turnovers—all of which were career highs. She continues the Terrapins’ six-year run of Tewaaraton winners (eighth all-time), following Katie Schwarzmann (2012, 2013) and Taylor Cummings (2014, 2015, 2016). The five women’s finalists were University of Maryland defender Nadine Hadnagy, Princeton attacker Olivia Hompe, University of North Carolina midfielder Marie McCool, Stony Brook University attacker Kylie Ohlmiller, and Stukenberg. This year’s initial Tewaaraton Watch Lists were announced on Feb. 28 and included the top 50 men’s and women’s college lacrosse players in the country. Two rounds of additions to the Watch Lists were announced, on March 16 and April 6. The top 25 nominees and five finalists were announced on April 28 and May 11, respectively. The selection committees are comprised of 15 men’s and 14 women’s current college coaches, and are chaired by U.S. Lacrosse National Lacrosse Hall of Fame coaches Jack Emmer (men’s) and Feffie Barnhill (women’s). Finalists will be the best five players chosen, without regard to institution. Finalists will be selected based on individual performance and a player’s contribution to the success of their team. Finalists are chosen based on the current year’s regular-season performance (date of selection is at the conclusion of the regular season, before playoffs). Recipients are chosen based on the current year’s regular season and playoff performance. Sportsmanship can play a role in the selection process, and it is important that the recipient upholds the mission and values of the Tewaaraton Award. Under Armour returns as the proud presenting sponsor of The Tewaaraton Award in honoring the top collegiate lacrosse players in the United States. For more information on the Tewaaraton Foundation and its charitable mission, visit tewaaraton.com. Like and follow The Tewaaraton Foundation at facebook.com/tewaaraton, twitter.com/tewaaraton and instagram.com/tewaaraton. Founded at the University Club of Washington, DC, and first presented in 2001, the Tewaaraton Award is recognized as the preeminent lacrosse award, annually honoring the top male and female college lacrosse player in the United States. Endorsed by the Mohawk Nation Council of Elders and U.S. Lacrosse, the Tewaaraton Award symbolizes lacrosse’s centuries-old roots in Native American heritage. The Tewaaraton Foundation ensures the integrity and advances the mission of this award. Each year, the Tewaaraton Award celebrates one of the six tribal nations of the Iroquois Confederacy – the Mohawk, Cayuga, Oneida, Onondaga, Seneca and Tuscarora – and presents two scholarships to students of Native American descent. To learn more about The Tewaaraton Foundation, please visit tewaaraton.com.